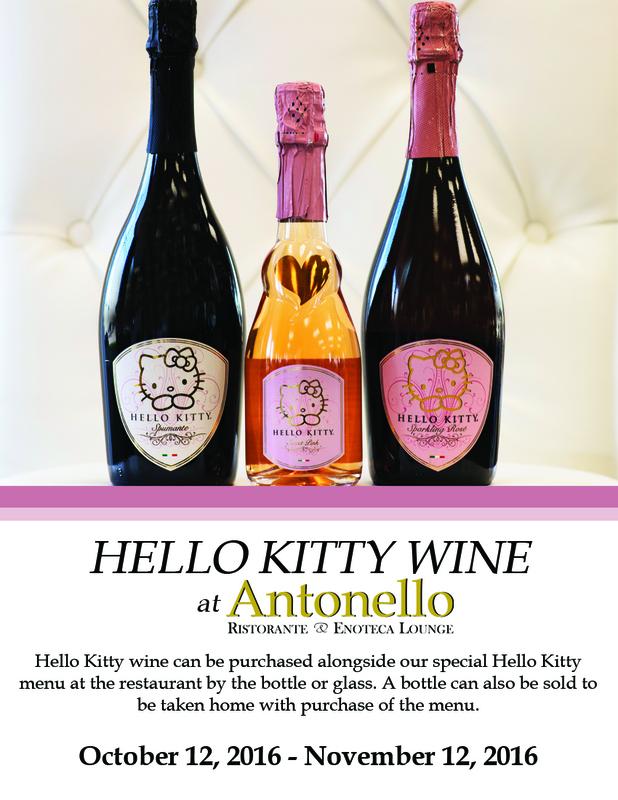 Oct. 12 - Nov. 12 | Exclusive Fancy Hello Kitty Wine and a 4-Course Themed Menu @ Antonello Ristorante - Santa Ana - EAT WITH HOP! Hello Kitty now has her own wine??! So apparently some peeps from the Sanrio company tasted some bombtastic wine at Torti Winery in Italy. It was soo good apparently, that Sanrio then contacted the family that makes the wine to create an exclusive wine for Hello Kitty and voila! 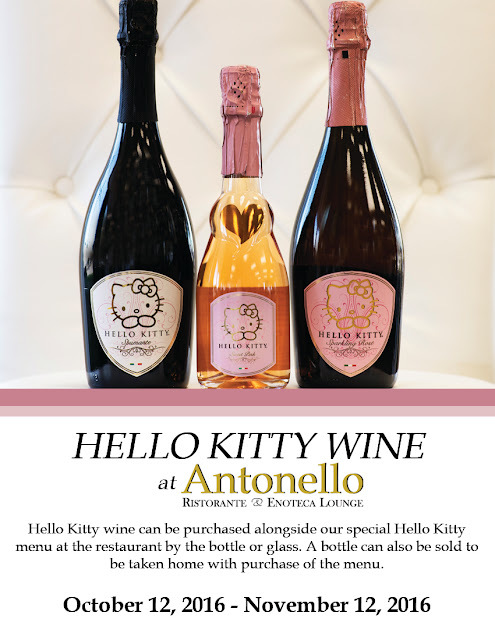 Hello Kitty now has her own exclusive wine that you can only get at a restaurant in Santa Ana: Antonello Ristorante (located in South Coast Plaza). I read about this tidbit from LA Weekly. 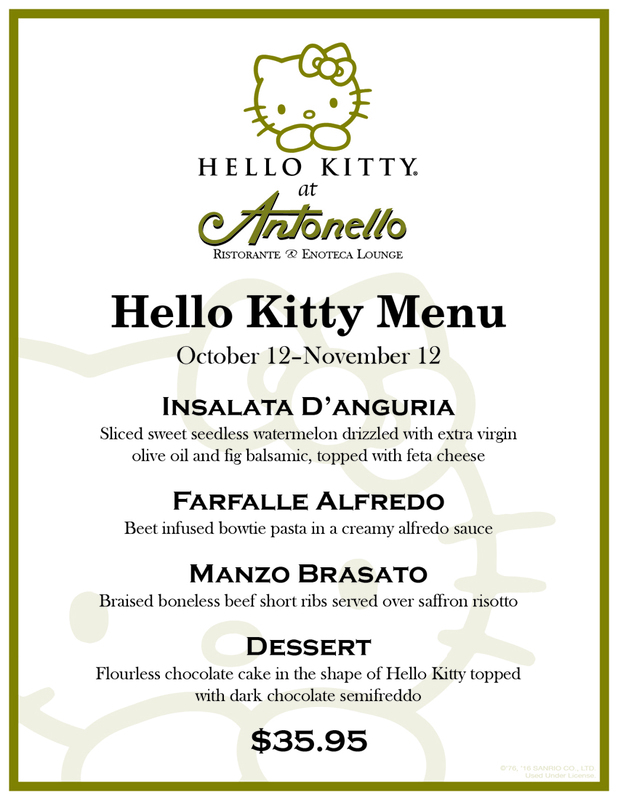 And through November 12, Antonello Ristorante is offering a special 4-course Hello Kitty themed menu! So first off, when I think of a themed menu, I think that the food should be creative and look very closely to whatever the theme is. I think of Japan. Their themed restaurants are top-notch in my opinion with menu items looking like the actual character or theme they are trying to portray. 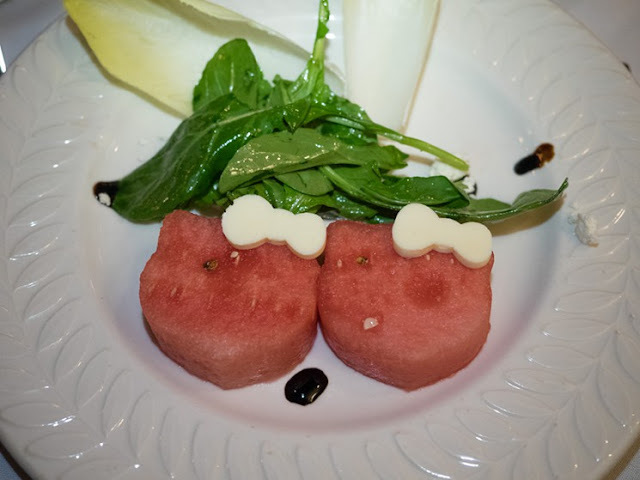 Which is exactly why I was disappointed in the menu at Antonello Ristorante. When I first heard about the event, I was SUPER EXCITED! I love themed anything! Themed restaurants, menus, etc.! It's just so exciting to get to eat something from someone's imagination. Like a cartoon or something. In this case, Hello Kitty. BUT I WAS SHOCKED that the menu was first of all... $35 ?! Like who are you kidding? And it seems like all the dishes were lazily created. Like, let's just add some bow tie pastas and make them pink. Now it's a Hello Kitty themed dish. Um.... no. This would be cool and all but like... all the photos that I saw online either were not very good or the dish itself doesn't look appetizing or appealing to Hello Kitty at all. I totally wanted to try the menu, but I had to look at all the photos first to see if it was even worth the $35. And it doesn't. the menu items look normal. Like they would serve it as a usual item on the menu. And the watermelon? This was the worst part. So the reason why I am ranting so much is because I really expected so much. Especially since it's $35.... Hello Kitty theme? Not even close. However, Antonello Ristorante, I will still want to go to your restaurant to try the risotto dish, the one where you literally melt a block of cheese. Now that's worth.